Sesame, in India has been a major cultivar since a long period of time ago. It has various names in various languages like til in Hindi, rassi in Odia, ellu in Tamil etc. These seeds are widely used as a cooking ingredient in Indian cuisines. Consuming white sesame increases warmth in our body. Sesame seeds have many medicinal properties which increases immunity, general as well as physical strength. Half cup of sesame seed contains approximately three times more calcium than half a cup of whole milk. Sesame seeds are also high in magnesium, manganese, vitamin B1, vitamin E, potassium, protein, fiber. This is winter time of the year. Consuming white sesame increases warmth in the body. Earlier, winters used to be really cold and people thought it's essential to 'fatten up' in order to survive the cold ;). Now-a-days, though we use variety of things to keep our body warm, still sesame seed ladoo or till ladoo or rassi ladoo are prepared in huge amount. Particularly these ladoos have a strong religious and cultural connection in our society linked to winter harvest festivals like Makar Sankranti, Lohri which are celebrated to thank God for a good harvest. Monday is again here. The Foodie Monday Blog Hop team has come up with a theme as 'Makar Sankranti Special'. So I have prepared some sesame brown sugar ladoo this year and contributed for the theme. Some more Makar Sankranti specials are Puffed Rice Chikki / Murmura Chikki, Makara Chaula (speciality of Odia Cuisine during Makar Sankranti). 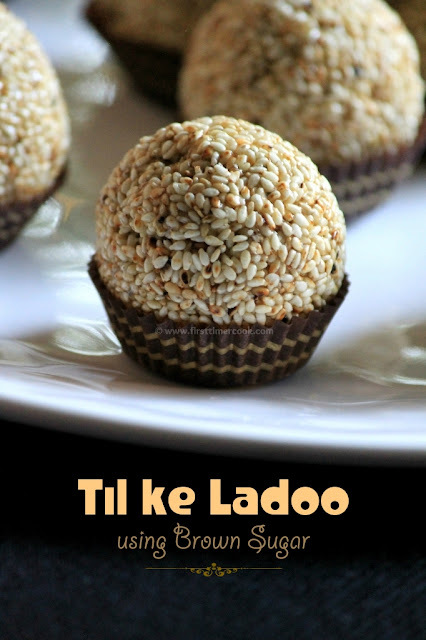 A simple sesame seed ladoo or rassi ladoo or til ke ladoo or til ladoo is traditionally made by roasting sesame seeds, combining them with jaggery syrup and finally rolling them into balls by using a small amount of ghee to prevent them from getting too sticky. 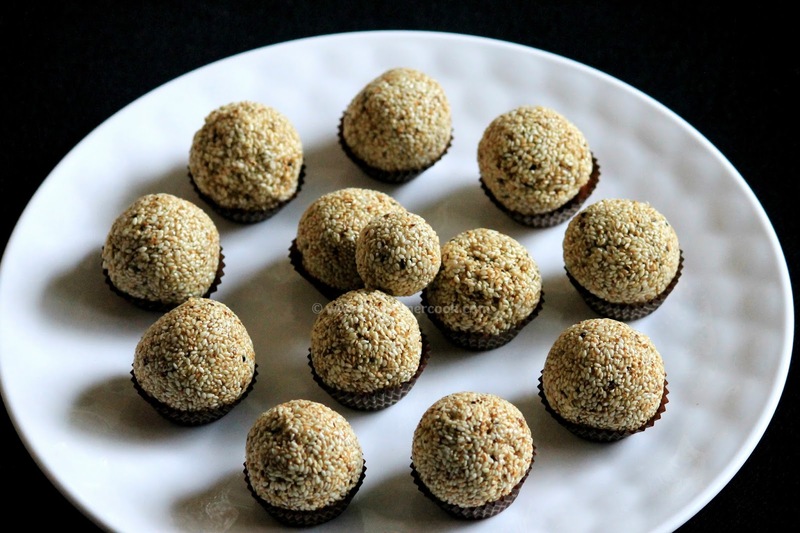 But in this recipe, instead of jaggery I have preferred brown sugar to make til ladoo. These are super easy to make and so quickly can be prepared. 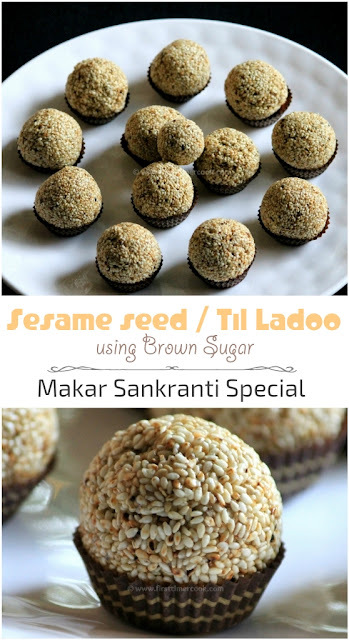 Eating til ke ladoo during Makar Sankranti festival is also considered as auspicious. 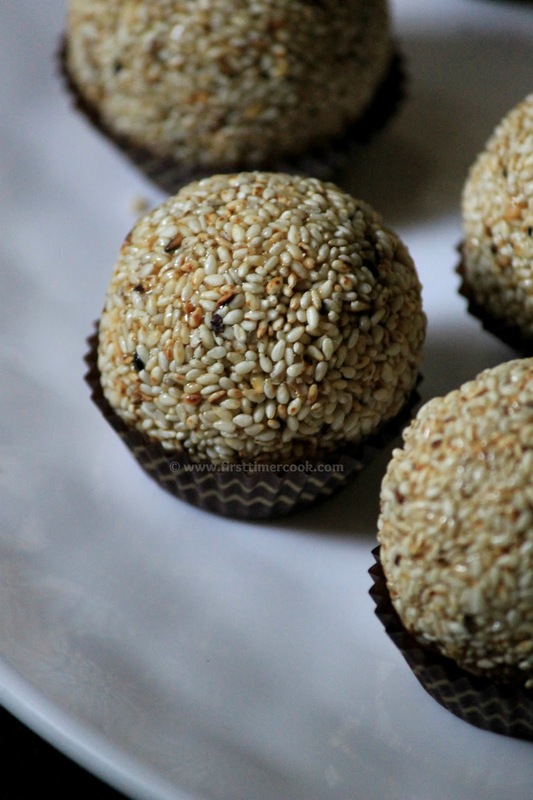 Sesame ladoo can also be munched at any time of the day, perfect for kids snacks as well. So below is the details method of preparation of this healthy, crunchy sesame brown sugar ladoo. In a pan first dry roast all the sesame seeds until light brown taking care not to burn. Next in the same pan, add water and brown sugar over low heat. Soon brown sugar starts caramelizing. Continue till a drop of hot syrup forms a ball in a bowl of water. Turn off heat and immediately add all the roasted sesame seeds and cardamom powder. Mix everything very well quickly, transfer to a plate and allow to cool a bit. When the mixture is still warm, grease palm with oil and start making round balls depending upon the desired size. Serve or store in an air tight container for later ! Sesame are roasted very quickly, making some crackling sounds. So be careful not to burn these seeds which results in a bitter taste of the ladoo. Some roughly broken peanuts (roasted) can be added to the mixture before making ladoos for some crunch. Jaggery or normal sugar can be used instead of brown sugar. 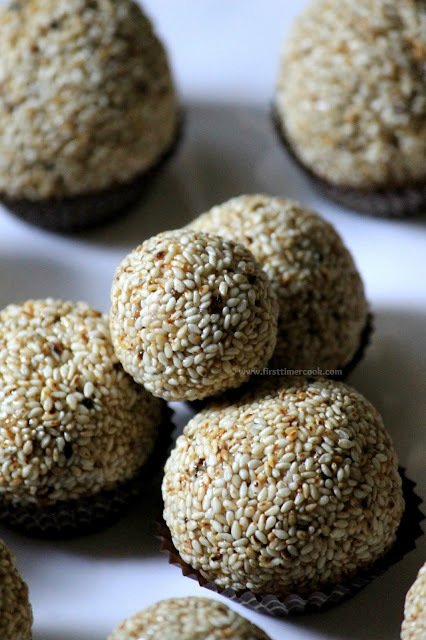 Sesame seeds Ladoo are a must at my place during this time of the year Sasmita..lovely share for the theme ! These look like a tasty treat! Thanks for sharing at Fiesta Friday! I really love these so much. Every dec trip to India I carry packets full of this. Didn’t realize it would be so easy to make. What a lovely click...my jeje ma used to make amazing Raasi ladoos. Beautiful tempting balls of healthy treat. You've shaped them perfectly. Love the clicks. An eternal favourite and your laddus are just so perfectly shaped!